Alwyn had a very successful career as a composer for films which tended to overshadow his more serious work. He composed in a number of genres and has gradually been more thoroughly represented in recordings. There are several versions of his five symphonies, including the composer's own for Lyrita, a label with a high reputation for superb engineering. A listener new to Alwyn will hear an ability to write noble themes in the form of Elgar, some spiky rhythms like Walton's, and touches of Hindemith and Sibelius, but the more you listen to his music, the more you discern his individuality. 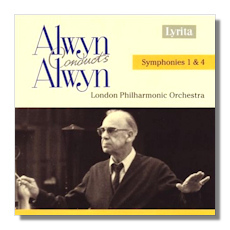 There is a lot of other recorded Alwyn to explore-I particularly recommend his beautiful harp concerto, Lyra Angelica.